okPORK took a new approach to the finale of Oklahoma Pork Congress this year. We decided to honor our award winners at lunch and then make the evening all about fun and food. Thus, Viva Las Bacon was born. Casino tables, buffets of food that featured two roasted whole hogs, good drinks and great fellowship were all a part of this exciting evening. There was also a silent auction, raffle and grand prize giveaway of $1,000 to cap of the night’s fun. “Our plans and dreams for Viva Las Bacon was a night that was simply about a good time and allowing Oklahoma’s pig farmers to enjoy themselves and to connect with each other,” said Nikki Snider, okPORK director of marketing and promotion. The casino tables were the center of the fun. 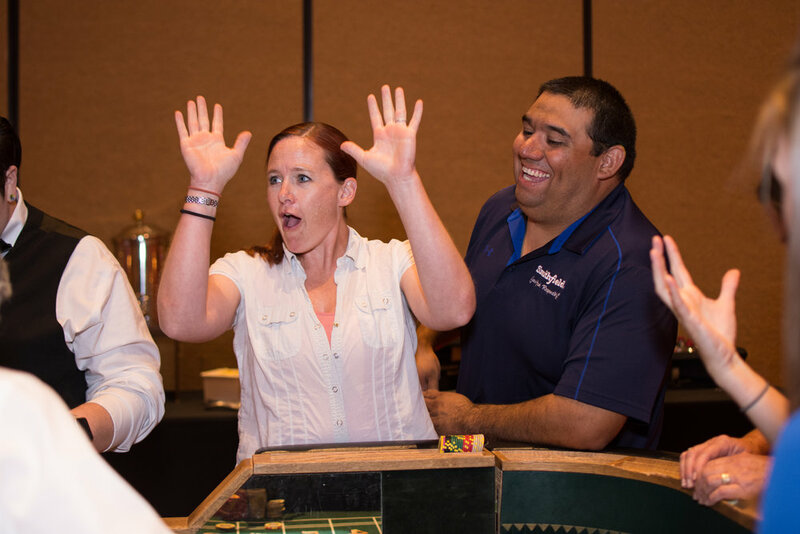 Each attendee received $2,000 worth of casino chips to play with at craps, Texas hold ‘em, roulette, and blackjack tables. At the end of the night, they had the opportunity to trade in their “winnings” for extra raffle tickets. Those tickets could be entered to win any of six raffle prizes; $750 to Cabela’s, a Kohler suitcase generator, an Extreme Sandbox experience, a stocked beer fridge, membership to a bacon of the month club, and a Kamado Joe grill/smoker. Everyone who attended the event received a blue and white okPORK poker chip that they entered to win the night’s grand prize - $1,000 cash. But everyone who attended were winners in the fun department. okPORK staff and board would also like to give a big thank you to all those who participated in our silent auction. This fundraising portion of Oklahoma Pork Congress is very important to okPORK’s non-Checkoff revenue. This year’s auction raised almost $4,000. Plans are already in the works for another fun casino night in 2019. So, stay tuned for all the details.